Generally speaking, I do not collect Children's flatware, although a lot of other people do. 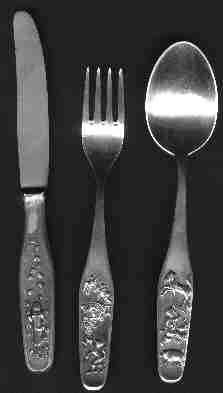 But recently I came across these three pieces from Germany which were done in 800 silver and in a nice Art Deco Style. I don't know the story behind this flatware set, so if anyone wishes to enlighten me, please send an email. If you are interested in obtaining this set, contact me.